We have always believed that while the design is important, what is equally important is the purity of the metal. In India, there are many silver products that are available with lower levels of silver- essentially mixed with other metals at varying percentages of silver from 50% to 92.5%. 92.5% silver is the highest proportion of silver that can be used to make jewellery. Beyond this silver becomes too soft and can bend easily. At 92.5% it is called Sterling Silver. Silver made with lower levels of silver can be gauged by the fact that those pieces are heavy (because they tend to use brass or copper) and resulting in losses for the buyer. Our pieces, because they are all 92.5%, are light and therefore easy to wear, and most importantly have the highest possible levels of purity. 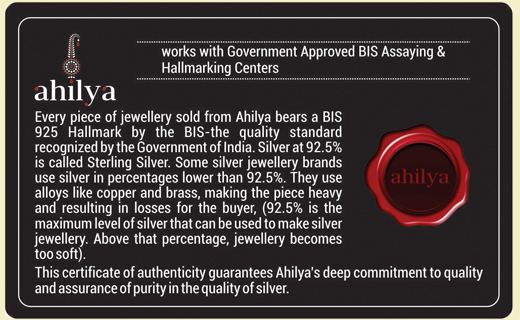 Each piece of jewellery sold from Ahilya has been tested and individually hallmarked: it bears a BIS 92.5 Hallmark, the quality standard recognized by the Government of India. The assurance of our quality is such that you will receive a certificate with every piece you buy from us. Hallmarking is the accurate determination and official recording of the proportionate content of the precious metal in gold or silver articles. 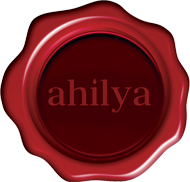 Hallmarks are thus official marks used as a guarantee of purity or fineness of precious gold or silver articles. They provide total product assurance and satisfaction that the consumer gets the right purity for a given price. 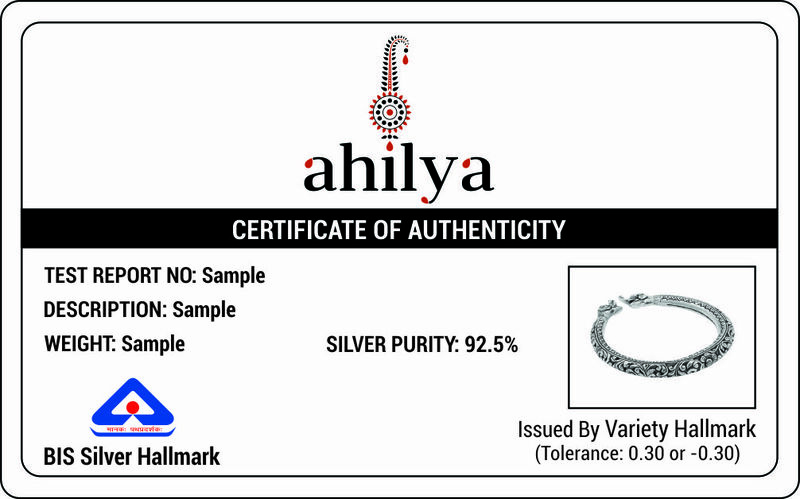 This certificate of authenticity guarantees Ahilyas deep commitment to quality and assurance of purity in the quality of silver.